Charles Curtis is an internationally acknowledged cellist of new and experimental music and is closely associated with the legendary avant-garde composer La Monte Young. He directed Young’s Theatre of Eternal Music String Ensemble and for a number of years was a central figure in the downtown New York free music scene. Curtis has expanded his oeuvre into the creative arts straddling the boundaries between art rock, sound art and minimalist composition. He has toured as a soloist and has led large ensembles in concerts mixing his own works and the works of other avant-garde composers (La Monte Young, Terry Jennings, Richard Maxfield, Morton Feldman). Curtis has also enjoyed an extensive and distinguished chamber music career. At the age of seventeen he won first prize in the Coleman International Chamber Music Competition and at 19 he made his Carnegie Hall debut playing the Tchaikovsky Trio with Oscar Shumsky and Earl Wild. 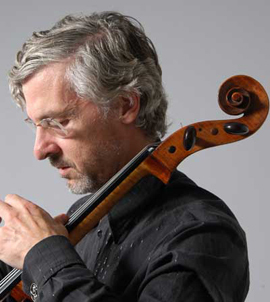 He has been the first solo cellist of the NDR Symphony Orchestra in Hamburg for eleven years and – ?a former faculty member at Princeton University – Curtis is now Professor of Contemporary Music Performance at the University of California, San Diego.